Not to be confused with the neighboring province of Shaanxi. "west of the Taihang Mountains"
Shanxi (Chinese: 山西; pinyin: Shānxī; Wade-Giles: Shan-hsi; Postal map spelling: Shansi) is a province of the People's Republic of China located in the northern part of the country. It borders Hebei to the east, Henan to the south, Shaanxi to the west, and Inner Mongolia to the north. The provincial capital city is Taiyuan. Shanxi's name literally means "mountains' west," which refers to the province's location west of the Taihang Mountains. Its one-character abbreviation is Jin (晋 pinyin jìn), after the state of Jin that existed here during the Spring and Autumn Period. According to Hanyu Pinyin rules, if tone marks are not written, both Shanxi and the neighboring province of Shaanxi should be spelled "Shanxi." However, the difference comes from the pronunciation tone: Shānxī and Shǎnxī. To make this difference clear without tonal marks, the spelling "Shaanxi" was contrived (following the romanization system of Yuen Ren Chao) for the province of Shǎnxī, while the spelling "Shanxi" has typically been used for the province of Shānxī. Shanxi had been an important province in ancient China with the ancient city of Pingyao serving as one the leading financial centers. The shift of capital to the Gold Coast of China during the twentieth century left Shanxi suffering economically. The provinces financial fortunes have declined, agriculture suffering from a lack of water and coal mining serving as a major economic activity. Coal miners in Shanxi have suffered death and injury at an alarming rate. Lagging behind other provinces in China with GDP, education suffers. Historically Shanxi has been a center for Buddhism and Daoism; a multitude of ancient monasteries exist in the mountains, many monks actively practicing their religion there. Shanxi, the location of the powerful state of Jin during the Spring and Autumn Period (722 B.C.E. - 403 B.C.E. ), underwent a three-way split into the respective states of Han, Zhao and Wei in 403 B.C.E., the traditional date taken as the start of the Warring States Period that lasted until 221 B.C.E.). By the end of that period, all of the states had fallen to the state of Qin, which established the Qin Dynasty (221 B.C.E. - 206 B.C.E.) and unified China. The Han Dynasty (206 B.C.E. - 220 C.E.) ruled Shanxi as the province (zhou) of Bingzhou (幷州 Bīng Zhōu). During the invasions of northern nomads during the Sixteen Kingdoms period (304-439) what is now Shanxi was controlled one after the other by several regimes, including the later Zhao, former Yan, former Qin, and later Yan Dynasties. This period of rule was followed by the rule of the Northern Wei (386-534), a Xianbei kingdom which had one of its earlier capitals at present-day Datong in northern Shanxi, and which went on to rule nearly all of northern China. During the Tang Dynasty (618-907) and after, the area was called Hédōng (河東), or "east of the (Yellow) river." During the first part of the Five Dynasties and Ten Kingdoms Period (907-960), Shanxi constituted three of the Five Dynasties, and was the only one of the Ten Kingdoms to be located in northern China. Shanxi was initially home to the jiedushi (commander) of Hedong, Li Cunxu, who overthrew the first of the Five Dynasties, the Later Liang Dynasty (907-923) to establish the second, the Later Tang Dynasty (923-936). Another jiedushi of Hedong, Shi Jingtang, overthrew the Later Tang to establish the third of the Five Dynasties, the Later Jin Dynasty. Finally, yet another jiedushi of Hedong, Liu Zhiyuan, established the fourth of the Five Dynasties, the Later Han Dynasty, after the Khitans destroyed the Later Jin Dynasty. When the fifth of the Five Dynasties (the Later Zhou Dynasty) was eventually established, the jiedushi of Hedong at the time, Liu Chong, rebelled and established an independent state called Northern Han, which served as one of the Ten Kingdoms and was located in what is now northern and central Shanxi. Shi Jingtang, the founder of the Later Jin Dynasty, (the third of the Five Dynasties), ceded a large slice of northern China to the Khitans in return for military assistance. This territory, called The Sixteen Prefectures of Yanyun, included a part of northern Shanxi. The ceded territory became a major problem for China's defense against the Khitans for the next 100 years, because it was located to the south of the Great Wall. During the Northern Song Dynasty (960-1127), the 16 ceded prefectures continued to be an area of hot contention between Song China and the Liao Dynasty. The Southern Song Dynasty that was born after abandoned all of North China to the Jurchen Jin Dynasty (1115-1234) in 1127, including Shanxi. The Mongol Yuan Dynasty divided China into provinces but did not establish Shanxi as a province. Shanxi was formally established with its present name and approximate borders by the Ming Dynasty (1368-1644). During the Qing Dynasty (1644-1911), Shanxi was extended northwards beyond the Great Wall to include parts of Inner Mongolia, including what is now the city of Hohhot. During most of the Republic of China's period of rule over mainland China (1912-1949), Shanxi was held by the warlord Yen Hsi-shan, even with all of the political upheavals that were taking place in the rest of China. During the Second Sino-Japanese War, Japan occupied much of the province after defeating China in the Battle of Taiyuan. Shanxi was also a major battlefield between the Japanese and the Chinese communist guerrillas of the Eighth Route Army during the war. After the defeat of Japan, much of the Shanxi countryside was used to establish bases for the communist People's Liberation Army in the ensuing Chinese Civil War. Yen Hsi-shan, the warlord who had ruled the area since the early 1900s, had incorporated thousands of former Japanese soldiers among his own forces, and they became part of his failed defense of Taiyuan against the People's Liberation Army in early 1949. For centuries, Shanxi was a major center of trade and banking, and the term "Shanxi merchant" (晋商 jìnshāng) was once synonymous with wealth. The well-preserved city of Pingyao, in Shanxi, also shows many signs of its former dominance as a center of trade and banking. In more recent times, the mining of coal has also begun to play an important role in Shanxi's economy. Shanxi is located on a plateau, which is in turn made up of higher ground to the east (Taihang Mountains) and the west (Lüliang Mountains), with a series of valleys running through the center. The highest peak is Mount Wutai (Wutai Shan), located in northeastern Shanxi at an altitude of 3058 m. The Great Wall of China forms most of the northern border between Shanxi and Inner Mongolia. The Yellow River acts as a natural western border between Shanxi and neighboring Shaanxi. The Fen and Qin rivers, which are tributaries of the Yellow River, run north-to-south through the province, and help drain much of its area. The northern part of the province is drained by tributaries of the Hai River, such as the Sanggan River and the Hutuo River. The largest natural lake in Shanxi is Xiechi Lake, a salt-water lake near Yuncheng, in southwestern Shanxi. Shanxi has a continental monsoon climate, and is rather arid, due to its proximity to the desert areas of Inner Mongolia. Average January temperatures are below 0 °C, while average July temperatures are around 21 - 26 °C. Annual precipitation averages around 350-700 mm, with 60 percent of it concentrated between June and August. 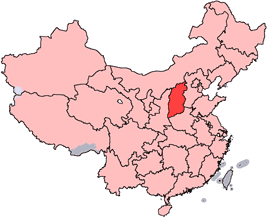 The 11 prefecture-level divisions of Shanxi are subdivided into 119 county-level divisions (23 districts, 11 county-level cities, and 85 counties). Those are in turn divided into 1,388 township-level divisions (561 towns, 634 townships, and 193 sub-districts). Shanxi's agricultural sector is largely limited by the province's arid climate and lack of water resources. As a result, only roughly 23 percent of its land area is able to be cultivated agriculturally. Some of the province's primary crops include rice, wheat, barley, maize, millet, sorghum, beans, and potatoes. Its' cash crops include cotton, tobacco, beets, vegetables, oil-bearing plants, and hemp. In addition to agriculture, the raising of animals also plays a role in the provincial economy, with pigs, sheep, chicken, rabbits, cows, [[donkeys], horses, mules, silkworm, and bees all being raised throughout the province. Over the past 40 years or so, Shanxi has established a basic industrial system made up of a variety of industries, including coal and chemical production, power generation, and metal refining. Currently, more than 12,000 different industrial enterprises are in operation in the province. However, the backbone of the provincial economy is made up of the coal and electric power industries. The province contains 260 billion metric tons of known coal deposits, equaling about one third of China's total. The Datong, Ningwu, Xishan, Hedong, Qinshui, and Huoxi coalfields are some of the most important in Shanxi. As a result of these abundant sources, Shanxi is one of the leading producers of coal in China, with annual production exceeding 300 million metric tons. Consequently, Shanxi is also a major electricity exporter for the People's Republic of China, providing, for example, nearly a quarter of the total power consumed in the country's capital city of Beijing. Along with coal, Shanxi also contains about 500 million tons of bauxite deposits, which makes up about one third of China's total bauxite reserves. Shanxi is also number one in all of China in its reserves of a few obscure minerals, including pearlite, refractory clay, gallium, and zeolite. Shanxi's nominal GDP in 2006 was 474.7 billion yuan (about US$60 billion), ranked eighteenth in China. 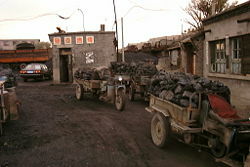 Shanxi is infamous for sub-par working conditions in its coal mines and other heavy industries. Thousands of workers have died every year in those industries, and several cases of child labor abuse were also discovered recently. The population is almost entirely Han Chinese, with small representation from a few different minority groups, including the Mongol, Manchu, and Hui people. In total, there are roughly 34 different minority groups in Shanxi province, but they make up a very small percentage of the total provincial population. Much like many of the other in-land provinces of China, education is lacking in Shanxi. In 2000, there were a total of 24 higher education institutions in the province, with 125,674 students and 10,466 teachers. There were 3,946 secondary schools with 2.38 million students and 152,427 teachers, and 37,451 primary schools with 3.44 million students and 180,362 teachers. There have been a few notable trends of the educational distribution in Shanxi's population. First, there has been a steady increase in the educated population at each level, with the exception of primary education, because of the fact that the population of the province has been aging and there has consequently been a smaller amount of primary-school age children. Secondly, there has been a decrease in the illiterate and halfway-illiterate population annually, and both trends are expected to continue as China continues to develop and grow in the future. All of the above universities are under the authority of the provincial government. Institutions not offering full-time bachelor programs are not listed. People in most regions of Shanxi speak dialects of Jin, a subdivision of spoken Chinese. However, dialects in the southwest near the border with Henan and Shaanxi are classified as part of the Zhongyuan Mandarin subdivision of the Mandarin group, rather than Jin. In terms of characteristics, Jin dialects are generally distinguished by their retention of the entering tone from Middle Chinese, and they are also noted for extremely complex tone sandhi systems. Shanxi cuisine is most well known for its extensive use of vinegar as a condiment as well as for its noodles. A dish originating from Taiyuan, the provincial capital, is the Taiyuan Tounao (太原头脑, literally "Taiyuan Head"). It is a soup brewed using mutton, shanyao (山药, Chinese wild yam), lotus roots, astragalus membranaceus (黄芪, membranous milk vetch), tuber onions, as well as cooking liquor for additional aroma. It can be enjoyed by dipping pieces of unleavened cake into the soup, and is reputed to have medicinal properties. (晋剧 Jinju) is a popular form of Chinese opera in Shanxi. It was popularized during the late Qing Dynasty, with the help of the then-ubiquitous Shanxi merchants who were active across several parts of China. Also called Zhonglu Bangzi (中路梆子), it is a type of bangzi opera (梆子), which is a group of operas that are generally distinguished by their use of wooden clappers for rhythm and by a more energetic singing style. Shanxi opera is also complemented by quzi (曲子), a blanket term for more melodic styles of music. Puzhou Opera (蒲剧 Puju), which is prevalent mostly in southern Shanxi, is a more ancient type of bangzi that makes use of very wide linear intervals. The movement and activities of Shanxi merchants (晋商 Jinshang) constituted a historical phenomenon that lasted for centuries from the Song to the Qing Dynasty. These merchants ranged far and wide from Central Asia to the coast of eastern China, and by the Qing Dynasty they were conducting trade across both sides of the Great Wall. During the late Qing Dynasty, a new development occurred: the creation of piaohao (票号), which were essentially small banks that provided services like money transfers and transactions, deposits, loans, and other financial services. After the establishment of the first piaohao in Pingyao, the bankers of Shanxi enjoyed nearly one hundred years of financial dominance across China before being eclipsed by the rise of larger banks in the modern period. The Ancient City of Pingyao is a World Heritage Site near Taiyuan. It was once a great financial center, and is noted for its preservation of many features of northern Han Chinese culture. It has been especially important in shedding light on the way of life of the Ming and Qing Dynasties. Yingxian Pagoda, in Ying County, is a pagoda built in 1056. It is octagonal with nine levels (five are visible from outside), and at 67 m, it is currently the tallest wooden pagoda in the world. Dazhai is a village in Xiyang County. Situated in hilly, difficult terrain, it was a holy site during the Cultural Revolution, when it was set out to the entire nation as an example of the hardiness of the proletariat, especially the peasants. 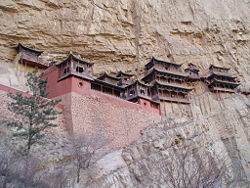 The Yungang Grottoes, a World Heritage Site in Datong, consist of 252 caves noted for their collection of fifth and sixth century Buddhist sculptures and reliefs. Mount Wutai (Wutai Shan) is the highest point in the province. It is known as the residence of the bodhisattva Manjusri, and as a result is also a major Buddhist pilgrimage destination, with many temples and other significant religious sights. 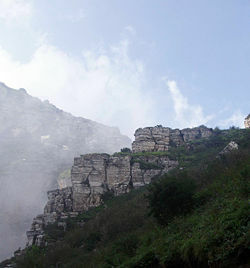 Mount Hengshan (Heng Shan), in Hunyuan County, is one of the "Five Great Peaks" of China, and is also a major Taoist site. Not far from Heng Shan, the Hanging Temple is located on the side of a cliff and has survived for 1,400 years despite earthquakes in the area. The Cloud Ridge Caves are shallow caves near Datong. There are over 50,000 carved images and statues of Buddhas and Boddhisatvas within these grottoes, ranging from 4 centimeters to 7 meters tall. Hukou Waterfall is located in the Yellow River on the Shanxi-Shaanxi border. At 50 meters high it is the second highest waterfall in China. ↑ Shanxi Shengoing, shanxigov.cn. Retrieved March 18, 2008. This page was last modified on 11 September 2015, at 15:20.